Reception: Tuesday, September 7, 5:00– 6:30 p.m.
trustmangallery@simmons.edu with Gallery Events in subject line. Repeat Performance will be on site in the Trustman Gallery from September 1 through 30, 2010. This unique installation is part of Memory Blocks, a body of work by artist Candy Nartonis that references memories and locations by color and color memory. Made up of individual pieces, ranging from 5 x 5 x ¾ inches to 16 x 16 x 2 inches, the blocks are mounted specifically for each site. The artist utilizes repetition and color shifts to represent the mood and sensation of being in specific situations. Though the original source of the inspiration remains with the artist, each installation is meant to generate memory and longing in the viewer. 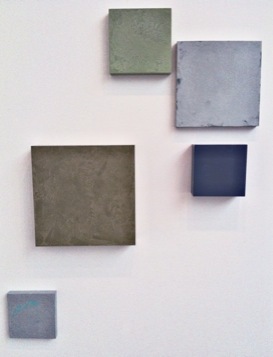 Nartonis’ Memory Blocks are in numerous public and private collections. In Boston, they can be seen at the John Hancock Tower’s Blue Glass Café on Stuart Street, where they are mounted on a 20 x 33 foot wall. They are also in the art collections of the Liberty Hotel and Berkshire Partners.